Are you tired of hearing mail order customers complain that their items arrive crumbled, bent or damaged in some way? The type of packaging in which you choose to ship your products makes all the difference in how happy your customers are when their order is delivered. While flimsy paper envelopes and packages might be cheaper initially, they’re going to cost you more in the long run because customers won’t be happy when their much-anticipate packages arrives with water damage or punctures. 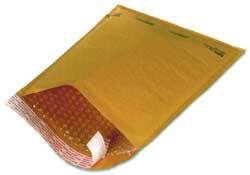 Using bubble mailers can be an easy way to keep your costs low and make your customers happy. Before you start shoving items of all shapes and sizes into bubble mailers, you should know that there are some items which are not safe to ship this way. Remember that these bubble mailers will protect items from bumps and falls, but they don’t have any resistance against stacking weight. If there’s a chances that the item inside could be crushed or broken if something is placed on top of the envelope, you’ll want to use a box or something more sturdy than a simple bubble mailer.